A big early gain for North American stock markets has mostly evaporated Friday, leaving major indexes only somewhat higher after two days of steep losses. Stocks remain volatile after the plunge, and they are on track for their biggest weekly losses in six months as investors have been rattled by big increases in interest rates. A big early gain for North American stock markets has mostly evaporated Friday, leaving major indexes only somewhat higher after two days of steep losses. Stocks remain volatile after the plunge, and they are on track for their biggest weekly losses in six months as investors have been rattled by big increases in interest rates and concerns that U.S.-China trade tensions are impairing global economic growth. The S&P/TSX composite index was up 107.19 points at 15,424.32, shortly after the trading day began, but down to 15,392.72 by mid-afternoon. The Dow Jones Industrial Average jumped as much as 414 points shortly after trading began. It had fallen more than 1,300 points over the previous two days. Technology companies regained a small piece of their recent losses, but other groups of stocks including banks and industrial companies turned lower following a strong start. Most of the stocks on the New York Stock Exchange fell. The S&P 500 index added 4 points, or 0.2 per cent, to 2,733 at 2:15 p.m. ET. The benchmark index tumbled 5.3 per cent over the past two days and as of Thursday it had fallen for six consecutive days. The S&P is down 6.7 per cent since from its latest record high, set Sept. 20. The Dow edged up 49 points, or 0.2 per cent, to 25,088. The Nasdaq composite gained 63 points, or 0.9 per cent, to 7,392. The Russell 2000 index gave up 12 points, or 0.8 per cent, to 1,532. That index, which is made up of smaller and more U.S.-focused companies, has fallen into a 10-per cent "correction" since reaching a record high at the end of August. Apple climbed 1.6 per cent to $217.79 US and Microsoft gained 1.5 per cent to $107.49 US. Consumer-focused companies also rallied, as Amazon jumped 2.2 per cent to $1,756.73 and Netflix surged 4.5 per cent to $335.43 US. Those companies have taken startling declines the last few days. On Wednesday the three most valuable U.S. companies, Apple, Microsoft and Amazon, each took their biggest loss in more than two years. It was a dramatic end to three months of calm on the U.S. market. The market's losing streak started when strong economic data and positive comments from Federal Reserve Chair Jerome Powell helped set off a wave of selling in the bond market. Investors dumped bonds as they bet that the U.S. economy would keep growing at a healthy pace. The sales pushed bond prices lower and yields to seven-year highs. That drove interest rates sharply higher, which worried investors who felt that a big increase in interest rates could eventually stifle economic growth. The International Monetary Fund also cut its forecast for global economic growth this week because of trade tensions and increased interest rates. 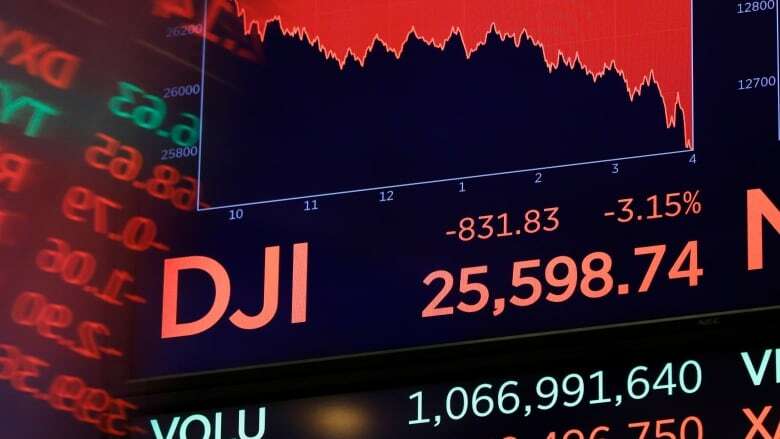 Sam Stovall, chief investment strategist for investment research firm CFRA, said he thought stocks fell too far, but there could be more turmoil ahead for the markets. While stocks had done well in spite of the rising trade tensions between China and the U.S., investors seem more worried now. U.S. crude oil fell 0.1 per cent to $70.93 a barrel in in New York. Brent crude, the international standard, lost 0.3 per cent to $80.01 a barrel in London. Bond prices were little changed. The yield on the 10-year Treasury note remained at 3.13 per cent. U.S. automakers Ford and General Motors continued to slump. GM shed 2.2 per cent to $31.60, its lowest in almost two years, and Ford dipped 2.8 per cent to $8.57, its lowest in almost nine years. Both have fallen more than 20 per cent this year as they deal with slowing sales and the Trump administration's tariffs on steel and aluminum, which are sending their manufacturing costs higher. After a big jump Thursday, gold lost 0.5 per cent to $1,222 an ounce. Silver rose 0.2 per cent to $14.64 an ounce. Copper slipped 0.1 per cent to $2.80 a pound. The Canadian dollar traded at 76.62 cents US compared with an average of 76.70 cents US on Thursday. The US dollar slipped to 111.98 yen from 111.94 yen. The euro fell to $1.1561 from $1.1594.